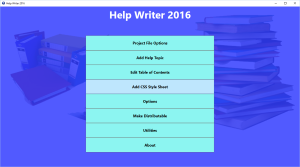 Help Writer 2016 makes documentation for the applications that you have written. It comes with both a visual and a code editor to make writing the help documentation quick and easy. 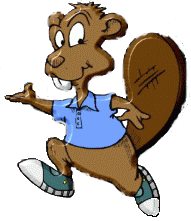 It keeps all of the documentation related files inside a project file that can also be used for distributing the help file. 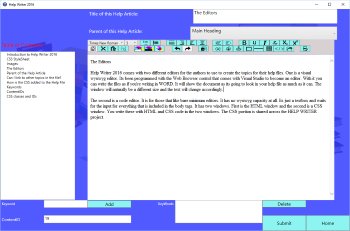 The files inside the project file includes html files, css, and information related to the help viewer system. Help Writer 2016 makes it easy to include CSS styling in your projects. You can enter your css once and it is shared across the entire project automatically. It also will style the visual editor so that it looks like what your final documentation help file will look like. The Help Writer proprietary viewer will seek out and link to topics that are similar to the one the customer is viewing. It uses the keywords you enter with each topic as a way to find the similar topics. It will show its findings at the bottom of the help article. You can use our Help Viewer with HWP files or DLL files. You get the same viewer that comes with our software. You can also have Help Writer create CHMs, PDFs, HTML, and docx files.